Last night, I went to see Muay Thai Live: The Legend Lives, the new Muay Thai stage show at Asiatique in Bangkok after a student of mine gave me some complimentary tickets as a gift. The show is created and directed by Ekachai Uekrongtham, director of Beautiful Boxer. The show depicts some of the greatest, legendary stories in Muay Thai history. The first, is ‘the Prisoner with Eight Limbs’ which is based on the story of Nai Kanomthom, a prisoner of war held captive in Burma who won his freedom by fighting and defeating ten Burmese gladiators while the Burmese king watched. The second is of the Tiger King or ‘Prachao Sua’, who reigned from 1703-1709. According to the tale, Siam was not at war at this time, so while the army was idle, the king ordered for them to practice Muay Thai. He loved Muay Thai so much that he often went to village fights in disguise in order to compete, once fighting in a tournament against three great fighters, defeating all of them. It was only being incognito that allowed him to compete, as if anyone had recognised him to be the king, of course, no one would have fought him. This character is played by ‘Art’ Attaporn, who also performed in the Beautiful Boxer movie. The next story was of Phraya Pichai, who was known as ‘the Warrior of Broken Swords’. A general serving under King Taksin, he fought with a sword in each hand. In one battle in 1773, the blade of one of his swords was broken in half. He then turned to his Muay Thai techniques to see him through the battle, and still succeeded in defeating the Burmese army, forcing them back across the border. After telling us the stories of some of the historical legends of Muay Thai, the performers then put on a display of various Muay Boran techniques, which is really awesome to watch. The show then switches to a romantic comedy to show us how these techniques can be applied in modern life with the story of ‘Passion Fighter’ a young, Muay Thai-obsessed man who is forced to fight a group of gangsters after they kidnap his girlfriend. Of course, he beats them all, gets the girl and a cheesy wedding scene follows. One of the fights in this sequence was a little odd, as it seemed to depict him fighting off a guy who appeared to be simultaneously attempting to both attack him and seduce him. ‘Passion Fighter’ also included the uses of other martial arts, including Taekwondo and wrestling. After the show, the cast are available for autographs and photos in the lobby through the gift shop, where you can also purchase a souvenir photo of yourself which they take before the show, although you’ll have to pay 240 baht for that. 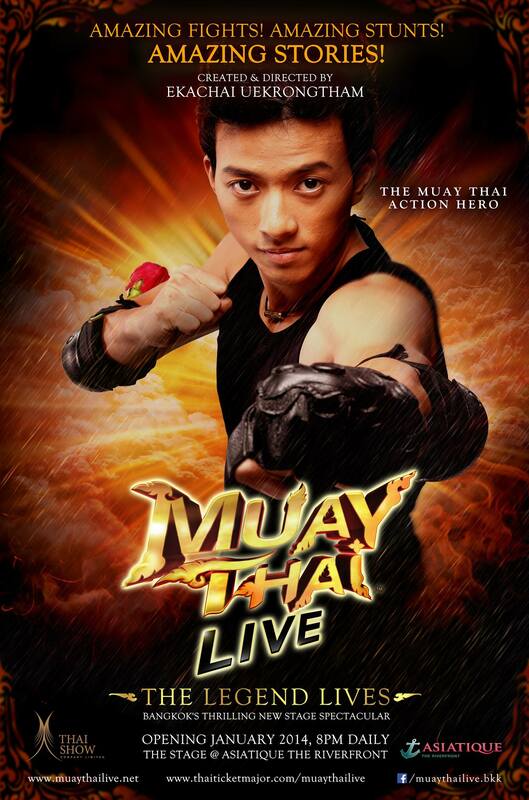 The combination of Muay Thai history and acrobatic, Muay Boran performances makes this quite an enjoyable show. While I wouldn’t say that the special effects were anything crazy, it’s definitely worth a watch. Asiatique also makes for a nice evening out in itself, and this was actually my first time there. Tickets can be bought on arrival from the box office outside the theatre. Advance tickets are available online from Thai Ticket Major and can also be reserved via the official ticket hotline on +66 (0)2 108 5999. Standard tickets are 1,200 baht while a premium seat is 1,500. The show takes place nightly at 20:00. Take the BTS / Skytrain to Saphan Taksin station. Underneath the station, there is a pier from which you can take a shuttle boat to Asiatique for 40 baht. Once you arrive at Asiatique, it’s a very short walk to to Warehouse 3, where the theatre is. The last boat back leaves at 22:00. Muay Thai Live: The Legend Lives Facebook Page and official website. This entry was posted in Uncategorized and tagged Bangkok, Entertainment, Legend Lives, Muay Thai Live, stage show. Bookmark the permalink.